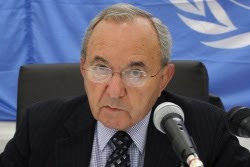 Over the weekend, retired South African judge Richard Goldstone admitted that his report on the December 2008-January 2009 Israeli military incursion into Gaza had wrongly accused the Jewish state of war crimes. Goldstone acknowledged the evidence provided in subsequent Israeli investigations had debunked the information he and his team was fed by the Palestinians during their UN-commissioned inquiry. The Goldstone episode again highlights a favorite tactic of Israel’s enemies, which is to make outlandish claims against the Jewish state, and then get the international media to print them, or even get the UN to adopt the claims. The Palestinians and their backers know that the international community is predisposed to believing the worst about Israel, and so will latch on to these lies without conducting so much as rudimentary fact-checking. When the truth finally surfaces, it is too late. The story is old news by that time, and no longer of interest to the media. The Goldstone Commission: Israel was accused by an official UN commission of purposely targeting Palestinian civilians during Operation Cast Lead, thereby leading to the deaths of well over 1,000 people in the Gaza Strip. The commission labeled the Israeli incursion an illegal action, despite the enormous Palestinian missile barrage on southern Israel that had preceded it. Only weeks later did reporters pick up on the discrepancies between Palestinian-provided casualty figures and the lack of patients in local hospitals. They didn’t bother to publish much about it. Several months after that, Hamas Interior Minister Fathi Hamad admitted that 700 of the people killed during the mini-war were Hamas fighters, matching the figures Israel originally provided. And now, two years after the fact, Goldstone himself has come forward and written in the Washington Post that Israel did not target Palestinian civilians, and was only acting to defend itself and its own civilians. Israeli leaders want an apology, but the damage has been done. Organ harvesting: In August 2009, Swedish newspaper Aftonbladet headlined a story claiming that Israeli soldiers were capturing Palestinian Arabs and harvesting their organs. The only evidence provided were the unsubstantiated claims of a handful of Palestinians. Nevertheless, the story became a sensation, leading to international outcries against Israel. The editor of the newspaper later admitted he had no proof that the claims were true, but defended his right to publish the blood libel regardless. Operation Defensive Shield: In 2002, following a particularly severe string of Palestinian terrorist attacks, Israel launched Operation Defensive Shield to root out the terrorist infrastructure in Judea and Samaria. One of the focal points was the northern Samaria town of Jenin. Of the 60 suicide bombers to attack Israelis in 2002, 23 had comes from Jenin. During what came to be known as the Battle of Jenin, the Palestinians claimed that over 500 civilians had been massacred and that Israeli forces had demolished large portions of the city. The accusations were broadcast around the world, leading to a massive outcry against Israel. Months later, it was revealed that only 52 Palestinians had died during the intense street battles in Jenin, and that most of them were armed militants. Israel lost 27 soldiers during the battle. A simple check of satellite photos also showed that Jenin had not been destroyed, and that the fighting had been limited to a small corner of Jenin where only a few buildings had been demolished. Israel was quietly absolved, but the damage had been done. Mohammed al-Dura: On September 30, 2000, Palestinian terrorists engaged Israeli soldiers stationed in the Gaza Strip. Video footage of the clash broadcast on and provided by France 2 showed 12-year-old Mohammed al-Dura hiding behind his terrified father as the bullets flew. Moments later, the boy slumps over dead and the father is wounded. Israel was immediately blamed for shooting the boy in cold blood, and Mohammed al-Dura became an internationally-recognized poster child for armed uprising against the Jewish state. Subsequent investigations by the Israeli army and other journalists have shown that the Israeli troops could not possibly have hit al-Dura from their position, even if they were trying to, and that the France 2 reporter on the scene may have been collaborating with the Palestinians. Phillipe Karsenty, a French media commentator, was sued by France 2 for questioning the authenticity of the footage. A French court later ruled that Karsenty had indeed provided compelling evidence that France 2’s report was faulty, but the damage was already done. Fainting schoolgirls: In 1983, a large number of Palestinian schoolgirls began fainting while at school. Accusations were immediately made that they had been poisoned, and that Israel had done it. The foreign press jumped on the story and reprinted it far and wide without bothering the check the facts. The UN Security Council condemned Israel for poisoning little girls. Months later, experts proved that the girls had in fact not been poisoned. The media stopped covering the story, and the UN remained silent. First Lebanon War: The Palestinians realized how they could manipulate the press and public opinion against Israel for the first time during the First Lebanon War. After Israeli forces entered Lebanon in response to incessant PLO attacks on northern Israel, the Palestinians claimed that 10,000 civilians had been killed and more than half a million displaced. The foreign reporters repeated the claims without checking the facts, like, for instance, that there were not even half a million people living in the whole of southern Lebanon. Media outlets also recycled images of destruction caused during the earlier Lebanese civil war as though it had been caused by Israel. Today’s blood libels against Israel mirror the historical blood libels against the Jews in their viciousness, their absurdity, and in the fact that even after being debunked and dismissed, they continue to haunt the Jewish people and act as a platform for hatred.